Wayne Stander began his volunteer career with KTWU in the 1980's when he came with Sunflower Lions Club to answer phones for a membership drive. He would eventually join the Auction Steering Committee and become its lead accountant for over 30 years. Wayne has been active behind the scenes, not wishing to be seen on air, but happy to work in a back office counting money and balancing figures, and reconciling the credit card machine report, after everyone else wearily goes home at the end of an auction shift. He is always there to open up for Pick Up and Pay the next day without complaint and with a smile to his fellow volunteers and high bidders. Wayne has worked 30 KTWU auctions. He recruits his fellow accountants and Sunflower Lions Club members to assist with accounting, distributing Express Bid numbers over the phone, registering bidders into the data base, and organizing and delivering items for Pick up and Pay. Wayne trains new volunteers and is a calming voice for everyone. Wayne is an asset to the team of employees and volunteers. His wisdom, memory, and strength of character are vital to operating this well-oiled machine, as our auction manager calls it. The Auction Steering Committee meets about six or seven times monthly prior to the actual event, "Lights, Camera, Auction," which is the first weekend of November. While he faithfully attends those, over the years, he and his wife have been known to make calls and pick up items for auction, along with recruiting, in between meetings. We have had a dozen auction managers through the years of his service, each with a different personality, perspective and vision for the auction. Through all the employee changes, Wayne maintains the steady course toward progress and financial stability for KTWU. Wayne was recognized on the station's website! 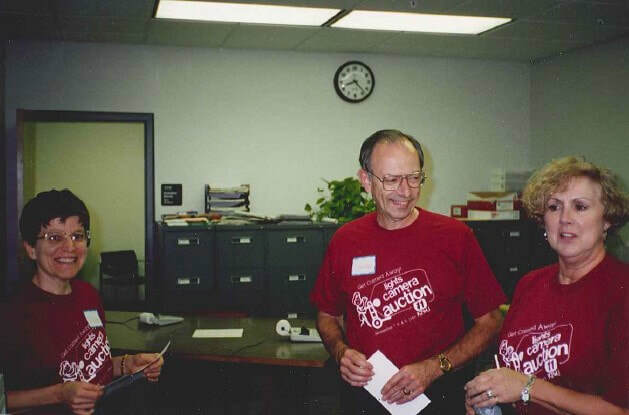 Wayne volunteering at an auction in the 1990s.